"This hotel was a great place to stay in terms of location." Have a question for Romantika Pension? Whether you're a tourist or traveling on business, Romantika Pension is a great choice for accommodation when visiting Mykonos. Only 4.0 km from the city center, the hotel's strategic location ensures that guests can quickly and easily reach many local points of interest. With the city's main attractions such as Mykonos Island National Airport, The Aegean Maritime Museum, Minima Gallery within close reach, visitors to the hotel will just love its location. At Romantika Pension, the excellent service and superior facilities make for an unforgettable stay. For the comfort and convenience of guests, the hotel offers car park, airport transfer, newspapers, tours, bar. All guest accommodations feature thoughtful amenities to ensure an unparalleled sense of comfort. The hotel's recreational facilities, which include private beach, garden are designed for escape and relaxation. When you are looking for comfortable and convenient accommodations in Mykonos, make Romantika Pension your home away from home. This hotel was a great place to stay in terms of location. 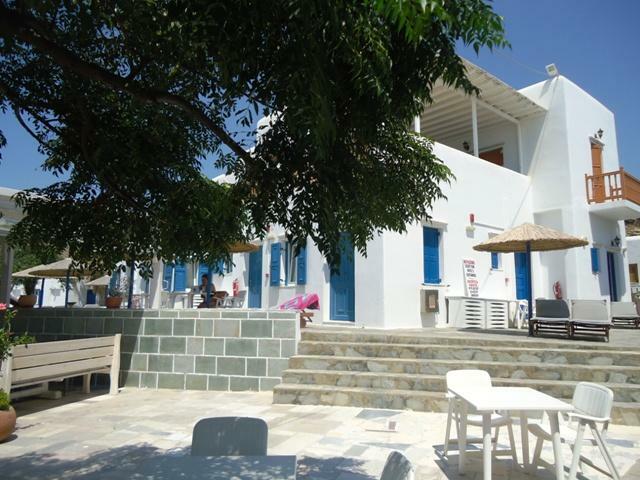 It is right on the beach and literally sits behind the row of restaurants and cafes. Having said this, it is not too busy or noisy at night. The rooms however, are quite simple and the wifi barely works. We were very lucky to have a friend who spoke Greek to translate for us as the owner is not too friendly to Tourists.